Stunning curves meet full-immersion bathing in the Soho 5.67 ft. Centre Drain Soaking Tub in White. Contemporary styling and soft lines contribute to the freestanding tub's modern aesthetic, sure to enrich your bathroom ambience and add a hint of serenity. This oval bathtub includes a floor-mounted single-handled chrome faucet along with chrome-finished overflow and drain outlets for a polished look. The acrylic construction is strong, light and warmer to the touch than typical steel or enamel tubs, allowing for easy installs and heat-retaining soaks. Add a luxurious statement to your bathroom with the Estate Freestanding Tub. This Traditional styled soaking tub is made of high quality acrylic. The uniquely designed "3-sided" freestanding tub can be installed against a wall to save on space or as a true free standing tub. Design versatility extends to the compatible tub fillers and can be installed with a free standing tub faucet, wall spout or deck-mount tub filler. It has a high gloss finish, making it easy to clean and coordinates beautifully with any Estate collection fixtures. Overflow cover and drain kit sold separately (1582000). Stretch out in full comfort with the Piron freestanding tub. 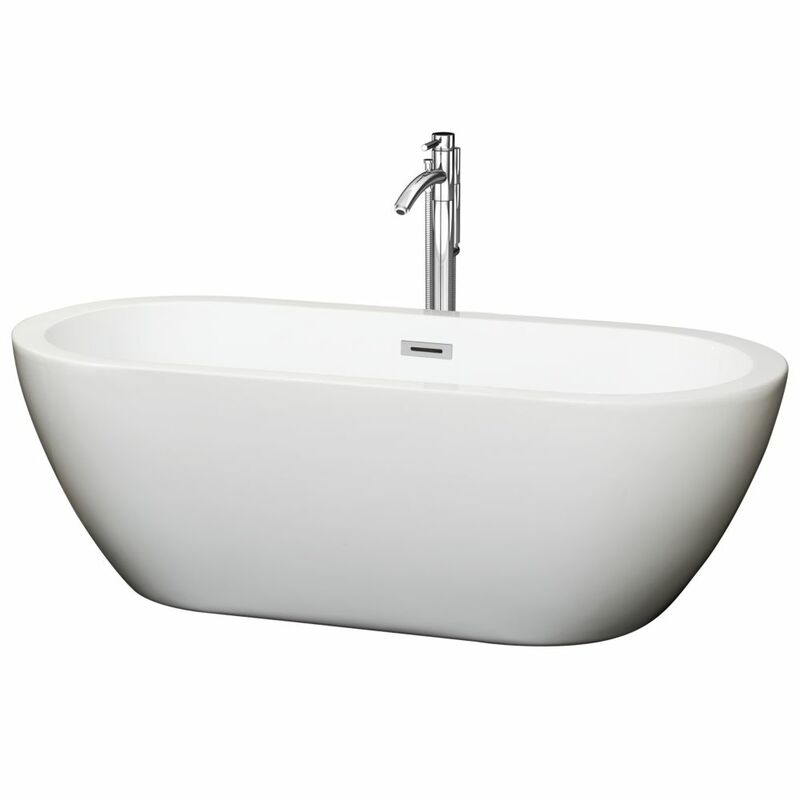 An ergonomic design provides back support at both ends and the deep basin offers a generous space to soak and relax. Acrylic construction and seamless design make maintenance as easy as slipping into a warm, wonderful bath at the end of a long, hard day. With its durable acrylic construction and attractive white finish, the KOHLER Sunward 5 ft. Reversible Drain Acrylic Soaking Tub in White will be a stylish addition to your bathroom. The oval basin design adds a creative dimensional element to your space. The drain location is reversible, which makes this tub versatile. Soho 68-inch Acrylic Centre Drain Soaking Tub in White with Floor Mounted Faucet in Chrome Stunning curves meet full-immersion bathing in the Soho 5.67 ft. Centre Drain Soaking Tub in White. Contemporary styling and soft lines contribute to the freestanding tub's modern aesthetic, sure to enrich your bathroom ambience and add a hint of serenity. This oval bathtub includes a floor-mounted single-handled chrome faucet along with chrome-finished overflow and drain outlets for a polished look. The acrylic construction is strong, light and warmer to the touch than typical steel or enamel tubs, allowing for easy installs and heat-retaining soaks. Soho 68-inch Acrylic Centre Drain Soaking Tub in White with Floor Mounted Faucet in Chrome is rated 3.5 out of 5 by 2. Rated 5 out of 5 by beh from Looks beautiful; bathroom still in remodel process, so I haven't been able to use yet...BUT I can... Looks beautiful; bathroom still in remodel process, so I haven't been able to use yet...BUT I can hardly wait! Need someone with plumbing experience to install.